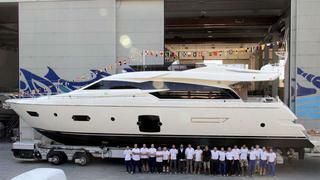 The first hull of the new Ferretti 750 motor yacht series was launched by the Ferretti Group in Italy. This model, which is the restyled version of the successful Ferretti 720 motor yacht, features a sleeker and sportier line, thanks to the new, lowered flybridge and an innovative stern area. The distinguishing feature of the stern area is the electro-hydraulic swim platform, which is more than 1.5m long. It can be lowered underwater, making the launching of the tender easier. The swim platform can lift up to 450 kg and it can host a tender of approximately four metres. As for interiors, the Ferretti 750 features many new decorating details and many different layout options, designed to meet with the specific needs of the different international markets where the Ferretti Group is present. On the main deck, for example, there are two different versions available: in the first one, the galley, the helm station, and the dinette are separated from the saloon and the living area by a sliding door. The second version features a country-style galley, open to the bow and to the stern. This last solution makes the main deck a wide open space, which is particularly suitable for the American market.